Summer camp professionals around the country, largely encouraged by the American Camp Association, have begun to refer to camps as “Youth Development Organizations.” Being at summer camp, we all agree it seems, is more than just “fun and games.” It’s beneficial for children in unique and lasting ways. Summer camps are dedicated to helping children grow, certainly also to have a good time, but perhaps most importantly, to gain valuable skills and foster personal development. But what are the ways children grow while at camp? We’ve often said Rockbrook is “a place for girls to grow,” but what kind of growth can we expect? 1. Social growth: Going to a sleepaway summer camp means joining a close community of people living and playing together 24/7. It builds inter-personal skills like sincere communication, conflict resolution, a willingness to share, and an enthusiasm for working as a team. Perhaps more importantly, the highly social nature of camp really encourages children to make friends easily. It’s a fun, down-to-earth, friendly environment that naturally draws children together. 2. Character growth: Summer camp, simply because it’s living away from home, is an ideal opportunity for children to become more independent. As they make decisions for themselves, for example when selecting their activity schedule, children learn to embrace the freedom (opportunities) and responsibility (consequences) their choices entail. With its non-competitive activities and with the care and support of the camp counselors and staff, camp provides children fantastic opportunities to succeed. It’s a real boost to campers’ self-confidence and self-esteem when every day includes accomplishment. Of course, it can also include setbacks and disappointments, but summer camp is always supportive and encouraging. It inspires resilience by providing role models of courage and determination. 3. Humane growth: An overnight camp like Rockbrook is also a great place for children to strengthen and develop greater humane values. Starting with a general warmth and sensitivity toward others, camp fosters cooperation and respect. Camp is also a place to meet children from different countries with perhaps unfamiliar cultural assumptions and religious traditions. It provides real world reminders, despite these differences, of our common humanity. 4. Practical growth: Residential summer camps provide an incredible variety of activities for children. They combine quality instruction, equipment and facilities specially designed to challenge kids’ sports abilities (like tennis and horseback riding), nurture their artistic and creative talents (painting, ceramics, and dance for example), and build their outdoor adventure abilities— all practical, real world, life-long skills. 5. Physical growth: Camp is chock full of action! Whether it be swimming, jumping, climbing, dancing, riding or running, Rockbrook keeps girls in motion. It introduces them to all kinds of ways to develop physical skills. With all the great food (made from scratch! 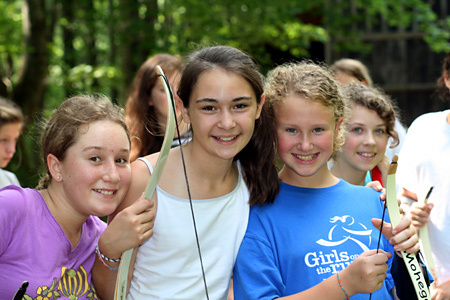 ), outdoor living, and big active fun, camp has important health benefits for children. Everyone knows Rockbrook is super fun, but in these five ways, it’s powerfully formative as well.